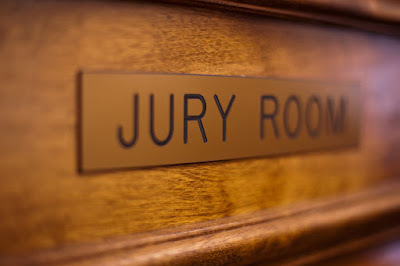 I reported to Jury Duty today. I was on standby all week and Wednesday Night my number came up. It wasn't unexpected, I saw how close we were getting and the odds of escaping my civic duty wasn't good. I reported to the Civil Court House. Myself and about 100 other mostly disgruntled New Yorkers. First panel was pulled at nearly 11 AM. I escaped. Second panel about 20 minutes later. Dodged that one too, but now the pool was smaller. We're all gamers, we do odds for stuff like this in our heads. Would we make it to 1 PM lunch? Just before Noon, another group of Jurors are called. I'm it. Save failed. One of twenty, marched off to our doom. There are two lawyers in the room waiting for us. We get handed questionnaires to fill out. Occupation? Retired. Know anyone currently or formerly employed in law enforcement, including yourself? Affirmative. Hobbies: Write Role-playing Games. If that ain't a dodge, I don't know what is. Seven names are called. I'm in seat number four. The first lawyer starts giving some background, the second demands a conference outside. A minute later, they are back. We are told its a "Summary Trial". Should be over in a day, two at most. Now I want in. THIS is a winner, and much better than sitting around a courthouse for a week or two on some never ending trial when I could be doing something fun - like writing role-playing games. The first lawyer starts talking. The second gets agitated. They leave the room, this time for ten minutes. I picture in my head the two fighting like gladiators to decide who is the dominant lawyer. Then I remember they are lawyers. Picture gone, filled with lots of "Objection!" and "Overruled!" After we are sent to lunch, the questions begin. I'm the fourth seat, so I get to see where the questions are going, or so I thought. "Mr Tenkar, it says here you are retired? What job did you have before retirement?" "Color me surprised! I never would have guessed." He smiled. I guess we do have a certain look after 20 years. "So, during those 20 years as a police officer, you must have prepared hundreds if not thousands of reports, is that not true?" "Perhaps, but I'm a bit distanced from those reports. I spent my last 12 years off patrol." "What was your last assignment Mr Tenkar?" "Hmmm. So, what do you do now that you are retired?" "I write role-playing games." Quizzical stare. "Er, Dungeons & Dragons." "Not a lot. But I do get sent to a couple of conventions every year on the company dime and it keeps me busy in beer money." There's some laughter in the Jury Panel. I went too far, damn it! "When I retire, that's the kind of retirement I want." He then went on to question the next potential juror. "I repair photostatic copy machines." Quizzical stare. "Er, Xerox machines." And thus does a trademark become diluted. It's pretty much always been the generic term for role playing games. Yeah, D&D has been synonymous with RPGs (to the uninitiated) since the early 80's. Good going, Erik! Sometimes failure is success and vice-versa. I LOL'd so hard at this I had to wipe my eyes with a Kleenex-- er, tissue. Then, I noticed my finger was cut and put a Band-Aid-- adhesive bandage on it after putting some Vaseline-- petroleum jelly on the gauze part. This totally made my week! Yay, evidence that RPG stigma is fading. Hope the case is interesting anyway. I'm actually shocked a defense attorney would have you on the jury, as they usually consider police and former police to be biased for the prosecution. You must have been in with some really interesting people or something about you must have clicked with the defense. Maybe he's a gamer. Here's a clue: if the defense mentions the word "role" "magic" or "sword" he's pandering to you. "I reported to the Civil Court House"
Sounds like a civil trial, not a criminal trial. Should be Career: role-playing games; Hobby: competing with cat on web-casts.